Growing Inventory of Floating Production Systems - There are now 264 floating production systems in operation. The number of units is 25% greater than five years ago, almost 85% higher than ten years back and triple the number of units fifteen years ago. Most of the growth has been in the number of Floating Production, Storage and Offloading Vessels (FPSOs). 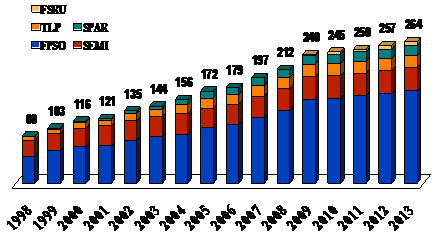 This figure has increased by 114 units over the past fifteen years. FPSOs now account for 63% of the existing systems. The balance is comprised of production semis, tension leg platforms, production spars, production barges and floating regasification/storage units. In addition to floating production systems, another 102 floating storage/offloading units (FSOs) are in service. Brazil is the largest location in terms of number of floating production systems now operating. There are now 55 FPSs in service offshore Brazil. The figure includes 35 FPSOs, 18 production semis and 2 FSRUs. West Africa is second largest with 48 FPUs in service, followed by the Gulf of Mexico (47 units), Northern Europe (39 units) and Southeast Asia (27 units). Backlog of production floater orders - The number of production floaters on order is at an all-time high. The current order backlog consists of 77 production floaters - 44 FPSOs, 7 production semis, 5 TLPs, 5 spars, 4 FLNGs and 12 FSRUs. Delivery of the equipment will grow the production floater inventory by 29%. In the backlog are 46 units utilizing purpose-built hulls and 31 units based on converted tanker hulls. Of the production floaters being built, 46 are owned by field operators, 31 are being supplied by leasing contractors. Brazil continues to dominate orders for production floaters - 26 units are being built for use offshore Brazil, 34% of the order backlog. 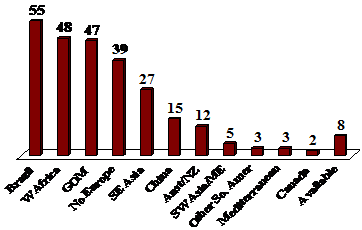 Planned Projects - The number of planned floater projects continues to grow. 248 projects potentially requiring a floating production or storage system are now in the planning stage. A year ago, 216 projects were being planned. Five years ago, the figure was 134 projects. Brazil is the principal location for new floating production projects. The huge pre-salt oil reserves offshore Brazil have been generating deepwater finds at a rapid pace. 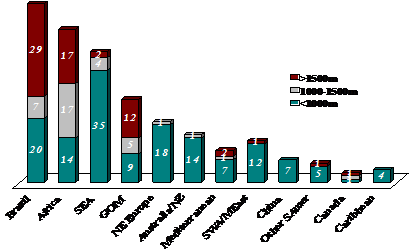 Africa is in second place in terms of planned floater projects, followed by Southeast Asia, Gulf of Mexico and Northern Europe. The growth in number of planned projects reflects the huge increase in deepwater drill equipment over the past decade. More than 150 drillships or deepwater semis have been ordered since 2003, removing a bottleneck that constrained exploration and development in deepwater. The result has been a dramatic increase in floater projects in the planning pipeline. Five Year Forecast - Our analysis indicates a requirement for 124 to 190 additional production floaters between 2013 and 2017. 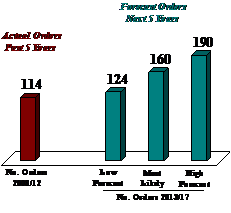 The most likely figure is 160 orders - which would be 40% greater than the number of orders over the past five years. FPSOs are expected to account for around 70% of future production floater orders. The remaining 30% will be production semis, spars, TLPs, FLNGs and FSRUs. Around 60 % of FPSO orders will be placed by leasing contractors, 40 % by field operators. Modification and redeployment of existing FPSOs will satisfy around 20 % of future FPSO requirements. · 124 to 190 production floaters forecast to be ordered over the next five years. An outline of the report and purchase details is available on the IMA website at www.imastudies.com. Further information can be obtained by contacting Jim McCaul by email at imaassoc@msn.com or by phone at 202 333 8501.